The Systems to Evaluate screen is the main list of computer systems within Part 11 Advisor. Users enter their computer systems into the Part 11 Advisor and can produce reports describing the compliance status of each. The screen allows users to enter information about the system being reviewed, including the type of system, data stored within the system, and the person responsible for the system. The status of the evaluation can also be tracked. 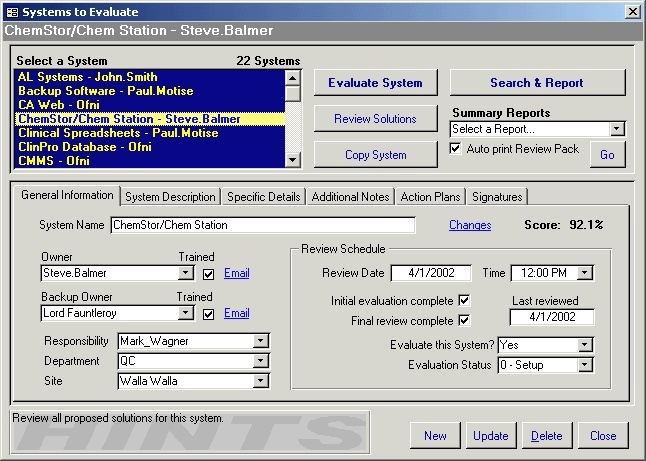 This screen allows users to generate the Part 11 Assessment and any gap assessments created for the system.